Hide this Project (Ecospace Business Park) Discover properties in other projects by hiding the ones that doesn't interest you. You won't see them in your searches further but you can unhide anytime later. 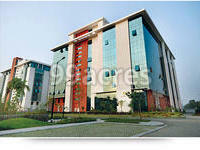 Eco Space Business Park is a commercial development by Ambuja Realty and RMZ Corp. It is located at Kolkata. It offers commercial space for offices and shops. The project is equipped with all the modern day amenities and basic facilities. Round the clock security is also available. What is the project location?The project is located at New Town, Kolkata East. What is the total area of Ecospace Business Park?The project spans across 10.0 Acres. Is Ecospace Business Park vastu compatible? The project is not compatible with Vastu.